It’s been a quiet week on Clastic Detritus … we went through a move earlier this week to be a little closer to my new job. We are still in the San Francisco Bay Area, not too far from where we used to live. We’ve spent the last week thinking about how we are going to get to our favorite Bay Area spots. So, for today’s Friday Field Foto I’m going to show you some of my favorite Bay Area rocks. These radiolarian cherts are beautifully exposed in the Marin Headlands area just over the Golden Gate Bridge north of San Francisco. Most people drive up there and stop along the pull-outs to gaze upon the bridge and the city skyline. Others (i.e., those of you reading this blog) take a look at the scenery and then turn around to look at these brick red and commonly spectacularly folded cherts. [This is a nice, big image…click on it for closer view]. The Marin Headlands are part of the Coast Ranges along the western edge of central and northern California (north of where the San Andreas Fault goes offshore) is made up of the Franciscan Subduction Complex. 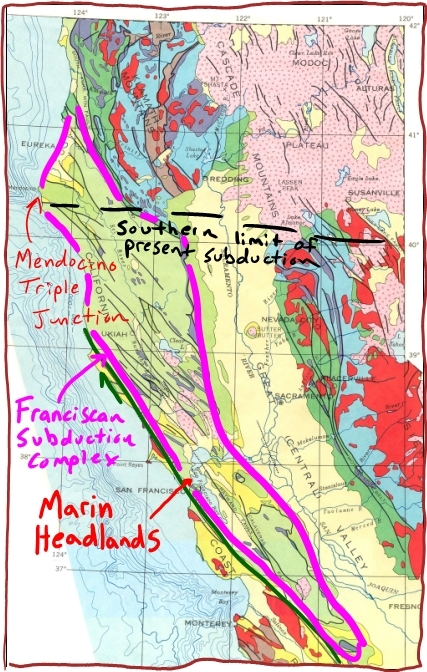 Today, the southern limit of subduction is the Mendocino Triple Junction. This triple junction (and the transform margin) has migrated north over time, however. Once upon a time, subduction was occurring all along central California (producing the Sierra Nevada arc which is so beautifully exhumed now). Here is a part of the California geologic map with some of my scribblings on it. The boundaries I’ve drawn for the Franciscan Complex are not super precise … but for the purposes of this post it will do. A subduction complex, by its very nature, is a complete mess. Essentially, this is material that has been scraped off the subducting plate and piled up against the continental margin. What’s fantastic about California is that the San Andreas transform has preserved the elements of the Mesozoic convergent margin for us to see. In the map above, you can easily see the three main elements of this system: (1) subduction complex, (2) forearc basin (Great Valley), and (3) magmatic arc (Sierra Nevada). This schematic cartoon portrays this system in cross section [image source here]. There are some interesting details regarding these cherts and their actual origin that I’ll post when I have more time. For now, I wanted to put them in this bigger plate tectonic context. If you are ever in San Francisco, make sure to take a trip to the Marin Headlands and check out these fantastic messed up cherts. Oh, and there are some decent views of one of the best cities in the world too. 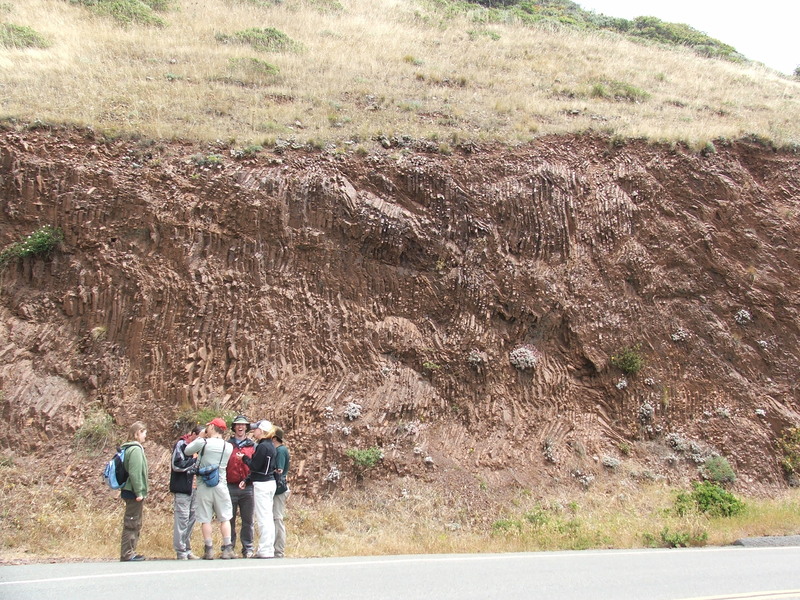 Check out this Friday Field Foto of some pillow basalts exposed on the Marin Headlands that are also part of this subduction complex. ← Will science reporters ever get it? Is the southern limit as east-west as you’ve drawn it, or is it more oblique? Mt. Lassen is the southernmost active volcano…which is just north of my dashed line. I’m not sure of the precise trend of that line…it could indeed be more oblique than I’m showing it here. Great blog! I love the cartoon image of the Franciscan formation and would like to use it in a paper I am writing (for class, not publication). However, the link to the source seems to be broken. Do you have the original website source from which you retrieved this picture? It has a similar diagram, but is a schematic cross section instead of a block diagram. I tried searching for that other image but couldn’t find it, sorry.